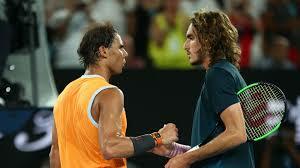 Add 20-year-old Stefanos Tsitsipas to the list of youngsters Nadal has bullied on his way to his 5th final at Melbourne Park and 25th at all Grand Slam tournaments. Nadal needed all of 11 minutes Thursday to show Tsitsipas and everyone else - that the kid's upset of Roger Federer was not going to be replicated on this night. Not even close. Breaking Tsitispas in the match's 3rd game and then another 5 times Thursday, while never facing a single break point himself until the very last game, Nadal won 6-2, 6-4, 6-0. "It felt like a different dimension of tennis completely," said the 14th-seeded Tsitsipas, a blank expression on his face. "He gives you no rhythm. He plays just a different game style than the rest of the players. He has this, I don't know, talent that no other player has. I've never seen a player have this. He makes you play bad." Asked if he was trying to make a statement with the way he soundly defeated these up-and-coming talents, Nadal said: They don't need any message, no. They are good. They're improving every month. So it's always a big challenge to play against them. Tsitsipas's run to the 1st major semifinal of his nascent career was most notable for the way he beat 20-time major champion Federer in the 4th round, saving 12 of 12 break points across 4 sets and 3 hours, 45 minutes. On Sunday, the 32-year-old Spaniard will try to earn his 2nd Australian Open title - he won the hard-court event in 2009 - and his 18th Slam trophy.